Commercial fishing is a daily job for some residents around Trout River in Gros Morne National Park in Newfoundland Labrador and this man puts his catch on the scales. Fishermen are very happy after a day of fishing when they have heavy bins loaded with cod and flounder. Weighing a fresh catch of Cod Fish and flounder in the harbour at Trout River, Gros Morne National Park, UNESCO World Heritage Site, Viking Trail, Trails to the Vikings, Highway 431, Northern Peninsula, Great Northern Peninsula, Newfoundland Labrador, Newfoundland, Canada. 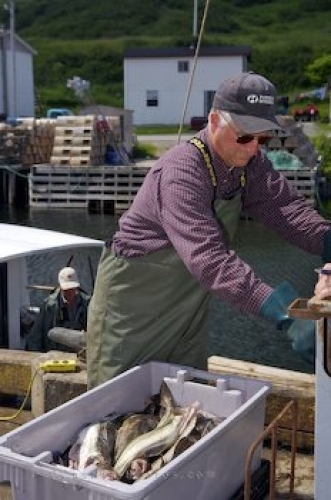 Picture of a man after fishing, weighing his cod at Trout River Harbour in Newfoundland.